In the 4th Century AD, the Roman Emperor Diocletian built the fortified complex as his retirement residence. Although this wonder has been drastically altered physically through the centuries, it is today the world's best-preserved Roman palace. And the multifarious alterations became a major tourist draw in themselves. This large barrel-vaulted subterranean rooms are imposing. Note: Some visitors miss out because they think that the space with the stalls selling jewelry and other items is the basement's famous attraction. It's not. Ask someone to direct you to the right place. 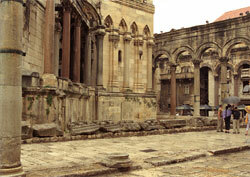 It was Diocletian's mausoleum before it was transformed into a church. The building conversion is ironic because the Roman emperor Diocletian was hell-bent on eradicating Christians. This sculpted courtyard is visually striking (see photo). The site's narrow passageways can become jammed in the summer with land and cruise tourists. Generally, the early morning or late afternoon hours are the least crowded. You can even come in the evenings (it never closes because people live there). The venue is relatively tourist-free then. The Diocletian Palace is large. It covers slightly over 30 hectares (8 acres).